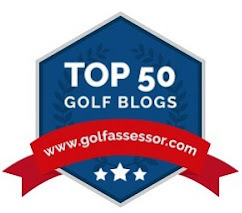 Ask.com, a question and answer site that receives more than one million specific questions everyday, researched the most frequently asked golf questions on its site. You may think these are all basic questions but how many of you actually know all the answers? Naturally, I have placed my snarky comments below each answer, in red ink. 1. What does golf stand for? A. The word golf likely originated from the Medieval Dutch word "kolf" or "kolve" which meant "club". I thought the word GOLF was an acronym for Gentlemen Only Ladies Forbidden! 2. How long does it take to play 18 holes of golf? A. Four hours is the estimate most people give for 18 holes. My answer depends on if you play the publinks in which a round of golf has taken me up to six hours! 3. What Percentage of Golfers Shoot under 100? A. There are 27 million golfers in America. Only 5 percent of them will ever break 100, and of that 5 percent only 2 percent of them will ever break 80. I have to agree with this answer, at least for publinks golfers. I play with many who have never broken 100 but I have not yet broken 80. 4. What degree is a pitching wedge? A. A pitching wedge is set at a 45 degree angle. One of my favorite clubs in my golf bag. I carry pitching, sand (56 degrees) and lob wedges (60 degrees) for different shots. You can never have too many wedges! 5. How many calories do I burn playing golf? A. How many calories a person burns while playing golf depends on three factors. One is body weight, as larger people burn more calories than their smaller counterparts. A second factor is how much time is spent playing golf, and the third aspect has to do with how active that person is on the range. A person who weighs 150 pounds and plays golf for two hours while he is carrying his clubs will burn 750 calories. A heavier person, weighing 200 pounds, will burn even more. During a two hour golf game, a 200-pound person carrying his golf clubs will burn 1,000 calories. In other words, walk and carry your golf clubs for golf to be more of a physical than mental game! 6. How do you fix a slice in golf? A. To fix a golf swing slice, it's important to realize that a slice is caused by the club face being left open when you strike the ball. Discover how you can fix your slice with help from a professional golf instructor. Don't try fixing your slice yourself or you might add more problems to your golf swing. 7. How many golf clubs can you carry? A. The rules of golf allow you to carry fourteen clubs in your bag, so many golfers add another iron or a specialty wood to the traditional set. For newer women golfers, try hybrid clubs instead of traditional woods: they are easier to hit and get the ball airborne. 8. How do you calculate your golf handicap? A. After figuring out a golf course's rating, take the score and subtract it from the course rating before multiplying it times 113 and dividing this number by the slope of the course. Take five scores and multiply the lowest by .96 to get a handicap. 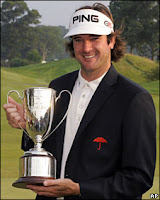 Check out USGA.org for more information on handicapping. 9. What is an albatross in Golf? A. Albatross is another term for a double eagle, or 3-under par on any one hole. How many golfers have ever gotten an albatross? Of course, for some, an albatross has the same connotation as in the Rime of the Ancient Mariner! 10. What does slope rating mean on a golf course? A. Slope rating is a numerical index of difficulty for an average (bogey) golfer. 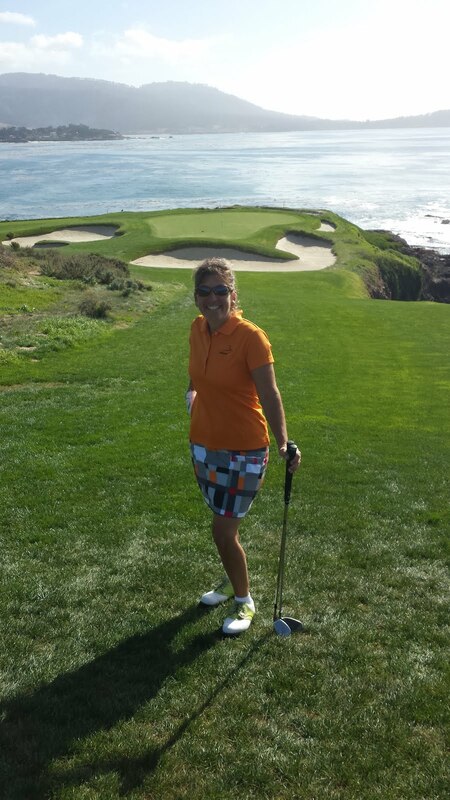 The higher the slope number, the more difficult the course is for the bogey golfer. I suggest that the average golfer look for courses with lower slope ratings until their scores improve, for a feeling of accomplishment! Kerr's trophy larger but Watson has better payday with "dream performances"
Cristie Kerr's record-setting twelve stroke victory at the LPGA Championship left her in a dream-like state. Bubba Watson's teary-eyed acceptance of his first PGA Tour win at the Travelers Championship was exciting to boot as he was the last man standing in a three-man playoff. Since I could not be at both events in the tri-state area, I chose the Travelers in order to meet-up at a "tweet-up" with Patricia Hannigan (aka golfgirl from Golf Girl Media). I can't wait to see the pictures she took and I'm sure she'll post them soon. Here are pictures of Cristie Kerr, winner of the LPGA Championship and Bubba Watson, fellow left-handed golfer, victor at the Traveler's Championship and first-time winner on the PGA Tour. 1. The natural beauty of TPC River Highlands golf course and holes 15-18 in particular have been written about extensively and need to be seen to be appreciated. Highlands is the opposite of Pebble Beach, in my opinion, and both are equally beautiful. Answers ranged from mine which was more tempered to those who have a "grip it and rip it" mentality. Lay-up on #15, go deep to avoid false front on #16th green, consider water in play on #17 & bunker on right of 18th green may be better than facing than facing swale on left. Seriously PGATour.com, should I really be offering advice to the best golfers in the world? 2. Top PGA Tour golfers like defending champion Kenny Perry, Padraig Harrington and Rickie Fowler will be up-close-and-personal, from the driving range to the putting green. 3. Michelob Ultra 19th Hole Concert Series brings out some of the best local bands in CT. Concerts will be held on Friday and Saturday, right after capping off a great day of golf! 4. Golf fans disappointed after a lackluster 2010 U.S. Open need a golf "recovery" tournament. 5. See the new and improved, slimmer John Daly at 185 pounds. Daly's rib injury seems to have passed and he is now working with improved confidence. JD is a great golfer to watch when he's in form but looking into the sun might be better for the eyes as his bright yellow and purple colored outfit can leave you with flash camera spots! Check the Golf Channel for weekday schedule, CBS-TV for weekend play or catch the action on PGATour.com. 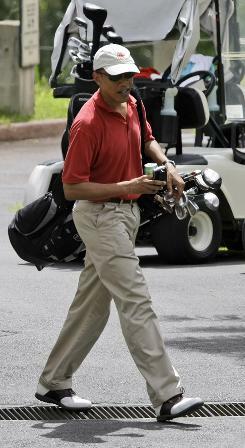 Should Barack Obama be criticized for playing golf while oil spills? Barack Obama has been taking some leisure time as of late, playing a round of golf, taking in a White Sox baseball game, and getting criticized for doing it. RNC Chairman Michael Steele stated, "As oil continues to spill in the Gulf and unemployment hovers at 10 percent, the President can no longer take his eye off the 'oil.' '' Very punny, Mr. Steele! Mr. Steele does have a point with regards to Obama's treatment of the oil spill. In my opinion, the President waited almost two months to connect with BP Chairman Tony Hayward and, after a twenty-minute closed door meeting, came away with a whopping $20 billion settlement that BP may or may not have in its coffers. The taxpayer is going to wind up with the burden once again unless the public helps come up with solutions. RT @stephlovescards Have u seen this? http://bit.ly/9eQeFY #Obama #BP take notice and clean up the oil spill already! "President Obama finds himself on yet another golf course as oil continues to spew into the Gulf," continued the RNC Chairman. "Until this problem is fixed, no more golf outings, no more baseball games, no more Beatle concerts, Mr. President." Nero fiddles while Rome burns? Same statement used by a Left-winger, for example, who chastised President Bush picking up a guitar, strumming along with folks on V-J Day. Should a President be allowed time for rest and relaxation in the midst of crises? The President of the USA (or any other country) leads by example. Father's Day should be a time spent with loved ones and I saw nothing wrong with quality time with his daughters. As far as sitting in on the Paul McCartney Concert, which woman wouldn't want 'Michelle' sung to her by a legend? Seriously, Mr. Obama, please help with the oil spill clean-up so that, in three more years, the public isn't trying to impeach you, much like the attack on President Bush. Since I'm putting in my wish list, health care plans have been on the table since 1993, "HillaryCare"... remember? Can the 2010 U.S. Open take the title of Golf's Greatest Championship? In his book, "Golf's Greatest Championship ", Julian Graubart states that "perhaps the most dramatic, competitive and passionate of all Open Championships" occurred at the 1960 U.S. Open in Cherry Hills, Colorado. Let us briefly look at what it would take for the 2010 U.S. Open to surpass this highly regarded historic event. Sam Snead and Ben Hogan, the two top names in golf at the time, were in the field and had the opportunity to win the event. Although Hogan tied for ninth place and Snead T-19th position, there would have to be some major well-known "starpower" in the final round in order for the 2010 U.S. Open to contend for golf's greatest championship. Sixty-year-old Tom Watson, who hit one of the most memorable shots in golf during the 1982 U.S. Open at Pebble Beach to defeat Jack Nicklaus, might do as this type of draw. Ben Hogan was forty-seven at the time and considered the "elder statesman" with four U.S. Open titles under his belt, knowing the Open may have been his last chance to secure the trophy. Two up and coming golfers, Arnold Palmer and Jack Nicklaus, were also in the mix. Whereas Palmer already had twelve victories under his belt and had just risen to leading money winner in the 1958 PGA Tour standings, "in the eyes of golf fans and writers, Palmer didn't particularly stand out," says Graubart. Arnie was formulating his "army" though and was on his way to becoming the Tour's "everyman." Phil Mickelson would do as the current-day Arnold Palmer as he is considered by some to be "everyman." The "meltdown" which occurred during Palmer's final round at the 1959 Masters was similar in nature to Mickelson's devastating final round defeat at the 2006 U.S. Open at Winged Foot. Nicklaus, on the other hand, was the new guy on the tour and still an amateur. Five amateurs in the field this week that Golfweek thinks we should keep an eye on are: Byeong-Hun An, Bennett Blakeman, Scott Langley, Kevin Phelan and Hudson Swafford. Who knows which of these five young guns could be in the hunt on Sunday? What about Tiger Woods? He would most certainly have to be a contender in order to topple the title of Golf's Greatest Championship, wouldn't he? Closing in on yet another major win is extremely important for Woods right now to get back into the mix, to get the fans rooting for him again and to catch up to Nicklaus's record. There would have to be the excitement of a "meltdown" and a "comeback" with close calls and close numbers during the final round. There would have to be low front nine scores with the excitement of not knowing who will win. The 1960 U.S. Open was won in the last two holes with only two strokes finally separating the winner from second place. Of course there are certain changes in history that will probably secure the 1960 U.S. Open as Golf's Greatest Championship. One major difference between the 1960 and 2010 U.S. Open is the mode of telecast. In 1960, there was no reviewing shots through videotape or through digital means. You either watched it live on NBC-TV or missed it or waited until you bought the newspaper the following day. With today's technology you get the option of TIVO, Internet, mobile web, television replays and the like, so you'll know when a golfer takes a breath or sneezes! Some of the excitement of live telecasts will be lost forever. The final 36 holes of golf would have to be played in the same day. It may be exhausting, but it would separate the men from the boys. But, should golf be considered a game of skill and endurance? That is why the majors are considered the game's ultimate test. One of my life-fulfilling wishes is to visit Hawaii, especially Oahu, where the entertainment value is high, the beaches and scenery are unparalleled and the golf is plenty. And so I was excited to be asked as a guest on The Golf Club Radio Show with Danielle Tucker, to chat about the 60th Jennie K Invitational, the condition of Mid Pacific Country Club and Hawaii Golf in general. As I googled and then clicked on the link to "Mid-Pac" Country Club, as it is called, you can't help but notice the beautiful scenery; crystal blue waters, mountains covered in light, fluffy clouds and sunsets that take your breath away. "Mid-Pac" is both "challenging and enjoyable" as stated on their website but, during our conversations with a few of the golfers prior to their respective rounds, I could see that the emphasis focused on "demanding". Questioning Jason Amoy, Superintendent of "Mid-Pac" and also a guest on the Show, led me to understand the amount of work needed to make the greens and the course USGA "friendly" as well. Although "Mid-Pac" is a "private" Country Club, you might be able to contact the Head Professional and obtain a tee time. It's worth a try! There are many other stunning Hawaii golf courses, so bring your sticks or rent a set because you will have such fun figuring out the trade winds that you will want to play golf every day! 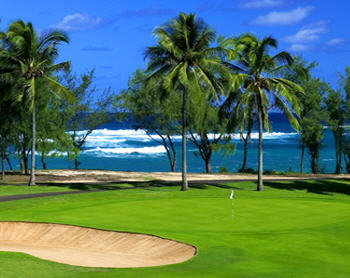 Several such "gems" are the Arnold Palmer and Tom Fazio Courses at Turtle Bay Resort. Located on Oahu's North Shore, Turtle Bay Resort is best known for the LPGA and Champions Tour events held at the beginning of the golf season. Turtle Bay Resort is now also the home of the Hawaii State Open. NBC Golf Analyst Mark Rolfing stated that "the Palmer Course is the best course on Oahu and Golf Digest listed it as one of the "2009 Top-100 Public Courses in America." 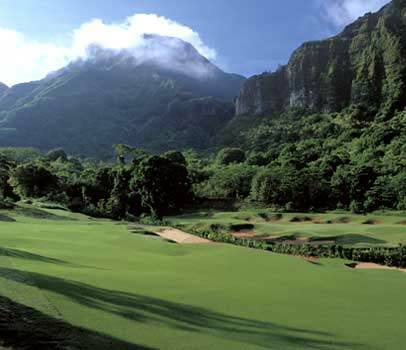 If your preference is to gaze at the amazing Ko'olau Ridge Mountain while being surrounded by a lush, tropical rain forest, plan a visit to the Ko'olau Golf Club. 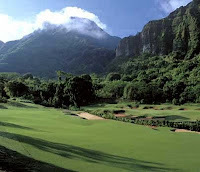 Rated the Number One Golf Course on Oahu by Golf Digest and nicknamed The Worlds Most Challenging Golf Course, tee times are about $130 per person which could be considered a "bargain" depending on how you score! When planning your Hawaii golf vacation, also consider Ewa Beach Golf Club, which is carved from a forest and considered a 'links' course as well as Honolulu Magazine's favorite, Makaha West Golf Club at Makaha Resort. If you are not sure that you can get around to 18 holes or you want to play 27, score a tee time at Hawaii Prince Golf Club which offers three interchangeable nines. For travelers who are considering 'island-hopping' through Hawaii, Maui is considered to be a premier destination for golf. Only a 30 minute flight from Oahu (about 70 miles) it is close enough to travel back-and-forth a few times in order to play some of the courses there. Morgan Pressel won the inaugural LPGA Classic held at the magnificent Kapalua Bay Course there and is the Resort's host professional. The Ka'anapali Golf Courses are more "must-plays." For those who wish to play golf near a volcano, don't miss "Old Blue" or Wailea Golf Club, at the base of Mt. Haleakala. I believe that skorts are a fashionable way to dress on Hawaii golf courses and so I think I will reserve the grass skirts for the hula at the Luau party afterward! Click on the link to schedule your Hawaii tee times. The 10,000 square foot behemoth on Jupiter Island that Tiger Woods calls home is finally near completion but will Woods feel lonely when he moves back in? Hardly as he shares the Island with some very high profile celebrities including Celine Dion, Nick Price, Burt Reynolds and Greg Norman. Norman tried to sell his digs last year for $65 million, couldn't find a buyer, dropped his price to $45 million, took it off the market and now has placed the mansion back into circulation for $65 million. 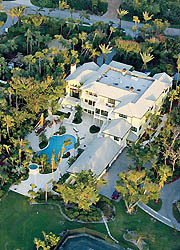 Former Lehman Bros. CEO Richard Fuld used to own digs on Jupiter Island but "sold" it to his wife for $100 after the company plummeted into bankruptcy. Here is a picture of the old TW "house" and a link to the renovated Tiger Woods estate which includes a 9,500 square foot exercise building, oxygen therapy room (for when the air gets too thin) and two pools. I understand that one of those pools is a "reflecting" pool for when Tiger needs to rethink how his life has changed over the past year. Click here to see the NEW and IMPROVED Tiger Woods Estate and pictures of Celine Dion's and Greg Norman's digs. Birthday Gifts for Phil Mickelson, the man who has it all! For Phil Mickelson's 39th birthday last year, wife Amy presented him with a dinosaur head, possibly a "Tarbosaurus bataar." What do you give the "man who has everything" as Mickelson called himself? Before you say "rocking chair", I've come up with gifts that Phil might appreciate for his 40th birthday. 1. One year of assorted Krispy Kreme donuts. Mickelson's favorite! 2. A winning assortment of "goodies" from Callaway. Mickelson has been testing new Callaway equipment and now needs the right driver, swing adjustments and confidence boosters to secure the U.S. Open trophy. 3. Five Guys now Six Guys? Mickelson won the bid to franchise Five Guys Burgers in Orange County, CA. Perhaps a winning shake to go with "the best burgers I've ever tasted"? 5. First tee time with Paddy Harrington and Y.E. Yang at the 2010 U.S. Open? Nah! A "pairing" with Tiger Woods would be a better gift with Mickelson thrashing Woods and coming out of the shadow of the world's number one golfer. 6. Okay, so we really can't give the gift of The Grand-Slam of Golf to Phil but it would be a great birthday wish. Phil is on his way with this year's Masters win. A little bit of confidence goes a long way. 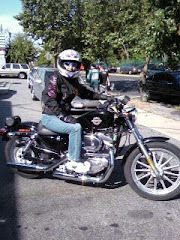 Probably, the most important birthday wish I could offer to Phil Mickelson is for Amy and mom to make a full recovery. You just can't put a price on good health! Golfers can usually see that I am left-handed because I suffer from "ghost-hand", that dreaded affliction which comes from one gloved paw and the other one open to the effects of the sun. Up until recently I grabbed golf gloves off the shelves, searching for a small, right-handed leftover that other lefties missed and that I could scavenge. No more searching is needed as I have found the Lady Classic Golf Glove. With a variety of colors and styles available and a unique UV Filter Fabric which offers SPF10 sun protection, the Lady Classic Solar Glove gives women the option of obtaining a great tan on the "ghost-hand" while looking tres-chic on the golf course. 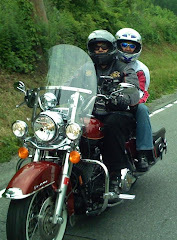 Take a Lady Classic on vacation as well, remembering that the sun is not your friend. The Lady Classic Golf Glove also comes in a soft-flex, ring finger and half-glove for showing off that glowing new manicure. Grab a new T-Glove (which secures a tee to the glove) for your husband for when he asks, "What did you get for me?" Did you ever wonder how a golf tournament is created? Most people rarely realize the dedication and hard work necessary to transform a course such as Whistling Straits into the venue needed for the PGA Championship. In the new web-series "Behind the Greens", fans can share in the excitement in the "building" of the 92nd PGA Championship, following the Course Superintendent, Operations Manager and Championship Director as they plan the event. From the initial "build-out" on June 20th, you will be able to watch as Whistling Straits is transformed into a "small city", adding bleachers, tents, skyboxes and making sure there is "enough power cords to keep the mini-city running." The web-series officially begins Thursday, June 3rd, but you can watch this cool trailer of Behind the Greens right now! Is Nicklaus ready to skin Woods before the Memorial? When Jack Nicklaus instituted the first nine-hole skins game before the 2009 Memorial Tournament, he chose Tiger Woods as one of this group. Fans got an eyeful watching the two greatest golfers in the world play side-by-side with Woods chipping in at eighteen to seal the deal. Last year, Nicklaus said, "They had me paired in the other group, and I said, uh-uh. I said, 'I haven't played with him for nine years. I'd like to play with Tiger.' So they said OK. I'm really looking forward to it." This year tells quite a different story as Nicklaus has extricated himself from Woods' group instead pairing himself with Phil Mickelson, Ernie Els, Sean O'Hair and Kenny Perry, all perceived by the public to be stand-up guys. Not that Steve Stricker (one of my favorite golfers besides Mickelson), Zack Johnson or Jim Furyk won't add a bit of pizazz to Woods' foursome (Rory McIlroy has possibilities as you can watch the girls swooning all around him) but what was the method to Nicklaus' decision? Bleacher Report asks, "Couldn't Jack have played with both of them?" It's also good to switch up the golfers from one year to the next. Kenny Perry played in the 2009 Woods/Nicklaus group and he isn't in the Golden Bear's 2010 "fivesome". Maybe Jack just doesn't want to hustle too much. In 2009 Nicklaus "made fun of himself for playing several of the par-4s like par-5s and suggested he needed to play from the forward tees." Tiger may be a tad too competitive for Nicklaus. Mickelson, just cut from the Colonial last week, may be more to his pace. This feels a bit like Ryder Cup whimsy, doesn't it? Free admission for kids tomorrow and, for those fans nowhere near Dublin, Ohio, you can catch the action on the Golf Channel from 1:00p.m. to 3:30 p.m.